It was not the image I intended to photograph this morning at Two Rivers Lake in Rocky Mountain National Park. The classic view from here is of Notchtop Mounain rising above Two Rivers Lake. After hiking the 3 miles into Two Rivers Lake, I was pelted with snow and rain accompanied by Rocky Mountain National Park's famous wind. Sunrise was very breif this morning and the alpenglow which can be seen lighting the base of Notchtop Mountain just below Grace Falls lasted only a minute or so before it was gone. Of the six frames I was able to capture of this dynamic scene, only one was usable because of rain and snow droplets that coated the front of my lens. 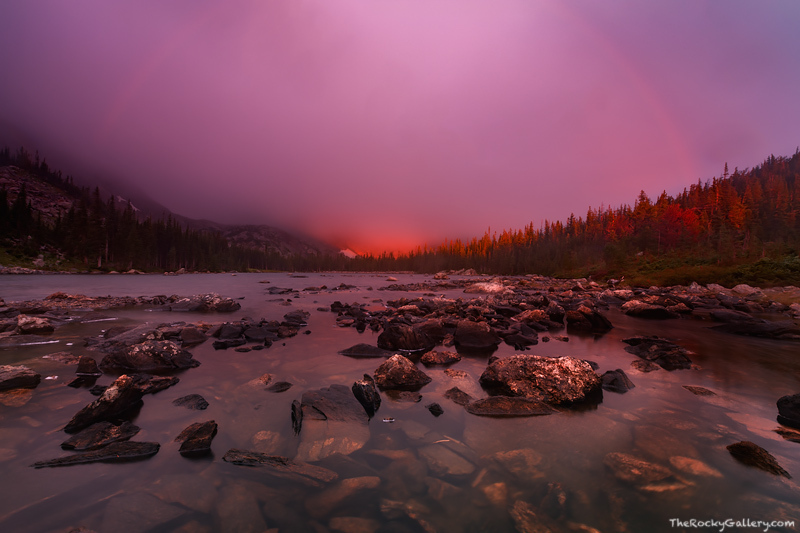 While I did not notice it when I was actuall photographing the scene, I was pleased to discover a faint rainbow that had formed over Two Rivers Lake. Photo © copyright by Thomas Mangan.